Two children and an adult have tested positive for the deadly H5N1 bird flu strain in Turkey's capital Ankara, the city's governor Kemal Onal has said. The results have not been confirmed by World Health Organization labs, but are still likely to trigger panic, says the BBC's Sarah Rainsford in Turkey. If confirmed they will be Turkey's first cases outside the eastern region of Van, about 1,000km (620 miles) away. Meanwhile two more children in Van have tested positive for H5N1, Mr Onal said. Our correspondent says the three people who tested positive in Ankara come from a town about one hour's drive from the city. It is not clear how they could have contracted the disease, although there were reports of ducks in the town having the virus, our correspondent adds. The results will now be checked by scientists at the WHO laboratory in London. In the eastern town of Dogubeyazit, in Van, three children from the same family died last week, at least two of them from the virulent H5N1 bird flu strain, which has killed more than 70 people in South-East Asia. Tests are still under way on the third child to see if she also died from H5N1. All three children - a 14-year-old boy and his 11 and 15-year-old sisters - were living in close contact with poultry and there is still no evidence that the disease has begun to spread between humans. Nonetheless a local hospital has been besieged by panicked residents seeking treatment for symptoms. 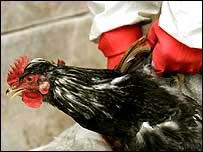 Twenty people remain in hospital in the city of Van receiving treatment for suspected bird flu. Health Minister Recep Akdag arrived in Van late on Sunday along with a team of officials from the WHO. They are due to travel to Dogubeyazit on Monday to help investigate the deaths and look for any signs of transmission between humans. The WHO has attempted to play down fears of the disease, as Turkish officials sought to defend themselves from accusations they were slow to act. The cull of all winged animals was only half complete almost a week after the first fatality, our correspondent said on Saturday. Officials say they have had difficulty persuading people in the impoverished rural region to deliver all of their poultry up for slaughter, whether the birds appear healthy or not. Meanwhile Iran, which shares a border with eastern Turkey, has closed one of its border crossings, officials told Turkey's Anatolia state news agency. And Russia's Interfax news agency reported on Sunday that the country's chief epidemiologist has told his countrymen not to travel to Turkey - a popular vacation destination for Russians - because of the bird flu outbreak. "I earnestly advise Russian citizens to refrain from travelling to Turkey, especially to the eastern province of Agri and the city of Dogubeyazit... where the situation is particularly alarming," Interfax quoted Gennady Onishchenko as saying.